Grain-Free, Sugar-Free & Low Carb Chocolate Molten Cakes! WOW! What a wonderful treat for Valentine’s Day! 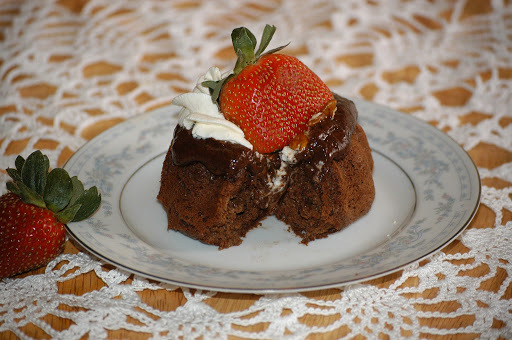 I would like to add that EVERYONE loved these Chocolate Molten Cakes this past weekend at the Farmer’s Market! They were a huge hit! One gentleman (not the health conscious type) said these were “the best cakes ever” then 30 minutes later he comes back to my table and brings his wife! Mission accomplished! 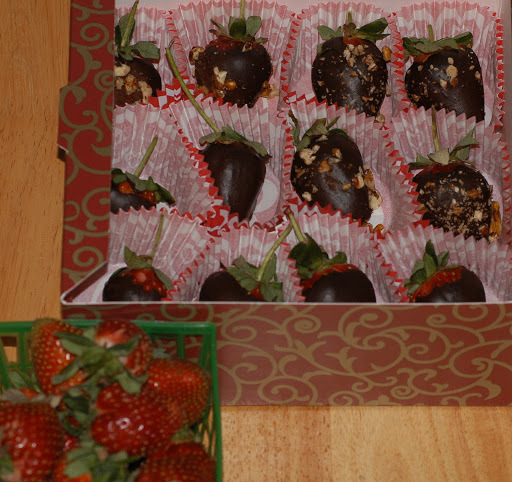 Don’t miss the truffles and chocolate covered strawberries at the end of the recipe! Put them in a pretty box and they would make a lovely and healthy Valentine’s Day gift! I used a large cupcake pan. Preheat oven to 325° F. Lube 3 wells of mini bundt cake pan or 3 large cupcake wells with butter or coconut oil. (Or place 6 liners in regular cupcake pan). In a medium bowl, beat egg whites until stiff peaks form. In another bowl, beat egg yolks, butter, sour cream, vanilla and coffee. Sift dry ingredients together into bowl with egg yolk mixture and stir well. Then fold in egg whites to flour and egg mixture. Taste for sweetness. Use (2) ice-cream scoops for the mini bundt or the large cupcake pan or one scoop if making regular cupcakes. Bake for 18 minutes for mini bundt, 22-23 minutes for large cupcakes and 15-17 minutes for regular cupcakes or until tooth pick inserted in center comes out clean. Allow to cool for 5 minutes in pan then carefully remove to cooling rack. Once cakes come out of oven, prepare double boiler by putting 1-2 inches of water in medium pot and placing glass bowl over water and simmer water on low heat. Measure heavy cream (or coconut milk) and add vanilla and stevia and whisk together. Pour milk mixture into glass bowl of double boiler. Next, place butter or coconut oil in cream mixture. Stir and watch for fat to melt. The heavy cream or coconut milk will get warm but it should not be hot enough to burn your finger. Once milk is warm enough, turn off heat and add finely chopped chocolate. Stir for a few seconds then using a dish rag, carefully remove the bowl from the double boiler and continue to whisk until all of chocolate is completely melted. Taste for sweetness and add more stevia (I prefer adding other sweetener at this point so that ganache isn’t bitter). **NOTE: This ganache will set up firm. If you want a less firm ganache, add 2-3 tbsp more of heavy cream or coconut milk. Assembly: Serve warm for Molten Cakes. Place warm mini-bundt cake on serving dish and use medium scoop or around 2 tbsp of fresh ganache and pour into the center of Bundt and over cake. Top with 1 scoop of ice cream or whipped heavy cream or coconut milk. Nuts are optional. What to do with leftover Ganache?? 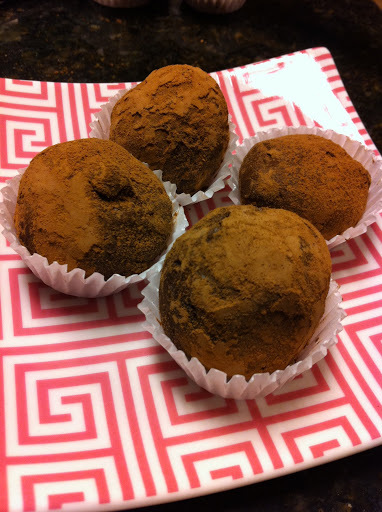 1) Truffles: Allow ganache to come to room temperature and use small scoop (or around 1 tbsp) and make truffles. With cool hands, roll 1 tbsp of mixture into balls and then in to unsweetened cocoa powder or chopped nuts. 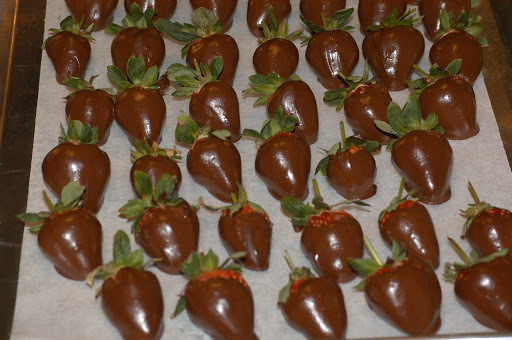 2) Chocolate Covered Strawberries: Clean strawberries under water and pat dry. Have strawberries ready to dip before starting the ganache. Also have a wax paper lined cookie sheet for dipped strawberries ready. Hold on to stems and dip strawberries in freshly prepared ganache then transfer to wax paper. You can also sprinkle chopped nuts over wet ganache and allow ganache to harden in refrigerator. « Super & Easy Foods for your Super Bowl Party! did you use coconut milk? mine came out chunky looking but the chocolate was melted all the way so I don’t know why it was like that. Not smooth at all. The only think I can think of is that the chocolate wasn’t chopped up fine enough and I didn’t have a chance to melt completely or your dairy (coconut milk or heavy cream) was too hot which caused the ganach to break. Try remelting the ganach in a double broiler. Sometimes you can salvage it and other times not. Hope this helps!